Established in 2009, Sigfox is a leading provider of “dedicated communications service for the Internet of Things” by providing a network that is a “simple, economical, energy-efficient two-way transmission of small quantities of data over long distances” that connects things to the cloud. Headquartered in Labège, France, Sigfox has offices in Boston, Dubai, Madrid, Munich, San Francisco, and Singapore, and is available in over 30 countries with 8 million connected objects living on its network. Sigfox recently introduced a new identity designed by the Paris, France, office of Interbrand. A microsite presenting the new identity can be found here. The butterfly is a strong symbol of transformation and freedom. We believe in the ‘butterfly effect’, which states that even very small, seemingly insignificant things can trigger monumental effects on a global scale. The butterfly is directly derived from the logotype Sigfox. If you look closer, you’ll see more than a beautiful budding insect. The Sigfox logo combined the mathematical purity of geometric forms with the friendly, and approachable style. Our new logotype is set in a custom, geometric sans-serif typeface and maintains the multi-colored of our logotype. The old logo had the right idea: a butterfly constructed from a thread of connection-ish lines of some digital kind but masking the lines inside a butterfly silhouette was the lazy way out. You have to custom-arrange them to fit the shape and create a unified element. The wordmark was interesting in its funkiness and it almost paired well with the icon but the overall combination of elements was not cohesive. The new logo maintains the butterfly and adds a heavy-handed dose of concept with galaxies coming together to form it. It’s actually a decent concept and very appropriate for the market but I won’t deny there is not a bit of eye-rolling in its admiration for its own grandeur. Still, the resulting icon is sharp and recognizable as a butterfly without being cloying. The single-color, stroke version of the icon is surprisingly effective. The wordmark is mostly fine, except for the “f” where the crossbar looks like the outstretched arm of a zombie. Golf clap. The sub-brands are very nicely extended into a wide range of variations. This looks “easy” but it’s really hard to do well. [The Living Rings] symbolize the two spheres we live in - our physical and digital worlds. Although we fluidly move back and forth between these two worlds, they often interlock. And when they do, this intersection forms a powerful ecosystem that’s perfectly geared to serve humankind. Rings with brand promise, “Make Things Come Alive”. Rings on photos. Smoother animations in the video at the top. I expected to dislike the rings because they feel like a basic graphic device that you would put on modem packaging or some other connecting device but they have used them quite well by exaggerating their size within the layouts and always keeping the strokes thin. The interaction with the elements in the photos is a nice touch and give the applications an added layer of dimension, especially in animation. The applications are remarkably nice… I’m surprised because, again, I didn’t think I was going to like all the blue to purple gradients, the techie type family, the rings, etc…. but everything is done quite thoughtfully and executed with precision. The “brochure system” image is so satisfying because it conveys the flexibility of a system that is coherent across variations. Overall, it’s a very strong identity that fits the industry and, while it speaks a similar visual language of other technology and telecommunications, it stands out for its crisp and well thought-out execution. Established in 2009, Sigfox is a leading provider of \"dedicated communications service for the Internet of Things\" by providing a network that is a \"simple, economical, energy-efficient two-way transmission of small quantities of data over long distances\" that connects things to the cloud. Headquartered in Labège, France, Sigfox has offices in Boston, Dubai, Madrid, Munich, San Francisco, and Singapore, and is available in over 30 countries with 8 million connected objects living on its network. 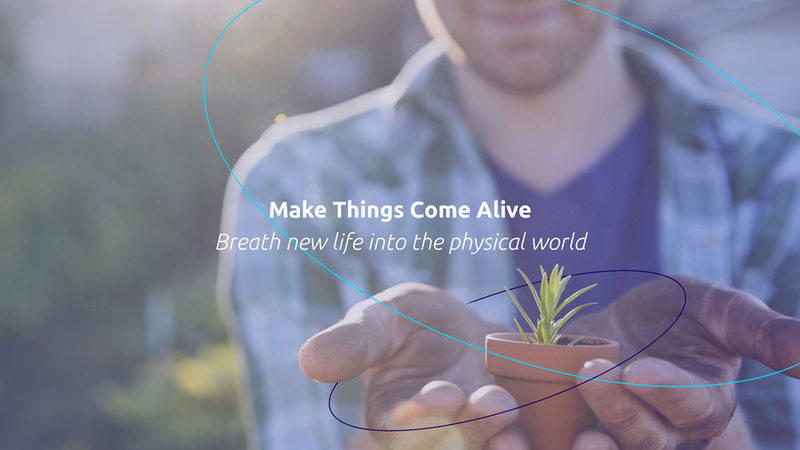 Sigfox recently introduced a new identity designed by the Paris, France, office of Interbrand.